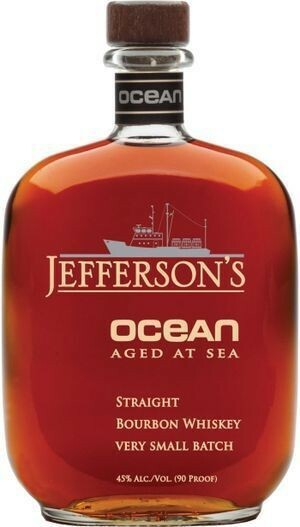 Inspired by the original Jefferson’s Ocean, which was new-filled bourbon barrels, the Jefferson’s Ocean: Aged at Sea takes older bourbon barrels and brings it around the world. Stopping in 5 different continents and crossing the equator 4 times, this bourbon truly is a world beater. A boat is a singularly uncommon place to age bourbon, but inspiration struck Trey on the deck of his friend Chris Fischer’s research ship. While watching Jefferson’s Reserve bourbon rock gently in its bottle, they wondered what would happen to bourbon aged on the bow of a ship. The caramelizing of the sugars in the barrel combined with the constant motion of the ship resulted in a dark bourbon with a briny, savory taste aged beyond its years.